I have to commend all of Dr.E's candles/ setting of lights work. They always try to be prompt in lighting the candles asap and I've had most of my petitions met. 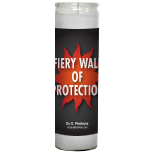 As for this candle, someone online was bothering me (as sometimes happens for cyber bullying). A few days after this candle was lit, I felt positive energy and that person has stopped bothering me. The candle report is always very insightful of what's happening or will happen. I will continue to patronize Dr.E's services. Thank you so much for all that you do Dr.E team! Date Added: 06/30/2016 by A. J.